Ever since the earthquakes, more than half a dozen years ago, there has been an incommensurate amount of publicity given to the (now ruined and deconsecrated) Cathedral at the centre of the city. 'The Cathedral', which is spoken of as if it were the only one. But it is not. It is merely the only Anglican one ... a few streets down there is, or was, another, in my opinion, a much finer building, dedicated by the Catholic Church. 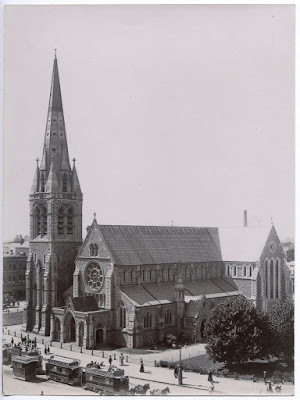 I lived in Christchurch in the 1960s, and used to have to pass The Cathedral each day on my way to University. I make no secret, I found it a gloomy, grey blot on the landscape. A mid-19th century bit of D-level architecture. Inside was even worse. Yes, I went inside. I was engaged to sing there. Otherwise I would probably not have. For I am no Anglican, indeed no Christian, and never was. But I love good architecture. Secular or religious. And loathe facile imitations. Which this was. I have told before how I watched the earthquake's depredations 'live on TV' from my 'hospital bed' a few days after a stroke. It was a surreal experience, and one that inspired little but horror and pity. All those people, all those lives ... but if there was a tiny glimpse of satisfaction nestled, for me, amongst the terrible sights and feelings, it was in seeing 'The Cathedral' topple ... at last, Christchurch is rid of the thing! But, of course, vested interests want it otherwise. And the squabble over whether the ruin should be cleared, and the Square made a public area for all of the population, and not just Anglican Christians, or whether the thing should be restored or rebuilt have made the news as recently as today. Everyone is fighting for his corner. But the Christchurch council has voted millions towards the replacement? The people's money. Ratepayers' money? From whence came the quote about 'propping up the Anglicans'. So it goes on. 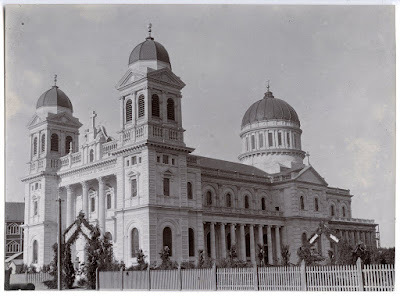 And in all this blathering, I have not heard (mind you, I haven't been listening) a thing about the Catholic Cathedral. Nor about suburban churches like the one at Woodend, unused and fenced off for the past six years.